FreedomWorks has, ad nauseam, discussed why net neutrality is nothing more than a crony ploy. It slows your Internet, diverts investments, and has nothing to do with both censorship and broadband competition. Yet, Amazon and other large Internet firms like Netflix persist with pro-neutrality advocacy and a demand to keep the Title II regulations that turned the Internet into a public utility. Yet, liberals and the Internet’s biggest companies somehow found common ground in the midst of alleged corporate plots to enslave America. All of a sudden, they both champion the (fraudulent) cause of Title II regulations for the Internet. Assuredly the day of action zealots at Amazon, led by CEO Jeff Bezos (net worth $86 billion), the same guy who wants an anti-trust law exemption to save his newspaper business at the Washington Post, also has the little guy in mind. Likely story. What Bezos and his competitors really want is the subsidization of their services. They want all bits of web traffic to be treated equally, when they inherently aren’t equal in nature. Video and streaming services require high speed end-to-end bandwidth connection that heavily burdens broadband networks. Netflix alone consumes 37% of bandwidth in the United States. And of course, Amazon now offers TV shows to its prime members. Some broadband companies want to offer tiered prices for services, meaning they charge bandwidth heavy websites more for better and faster services. Those websites with less demanding consumption, like an email site or a blog, need not pay extra. This isn’t anti-competitive, it’s innovative. Under net neutrality, all sites pay for the same broadband speed. Your emails travel through the same pipes as heavy video streaming, ultimately slowing both down. But Amazon and Netflix don’t have to pay for damaging your connection. Shouldn’t big companies pay their fair share? Certainly, you would want the shipping rate for a 500lbs package to be greater than a 5lbs package. Almost every other service in America works like this. Use less, pay less. Net neutrality is a price control that subsidizes special interests at the expense of others. It’s a true shame that Amazon wants net neutrality. 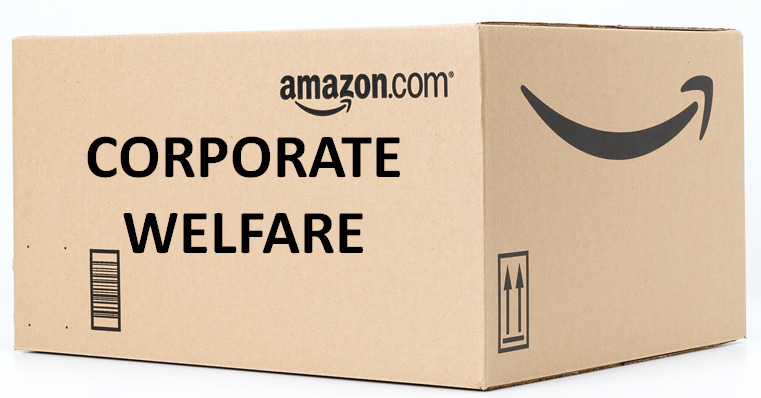 Apart from its welfare greed, Amazon is a free-market capitalist champion. Bezos and his business have lowered costs and improved services for Americans across the board. His online shopping services help Americans save time and money. Buying stuff on Amazon.com takes less time than browsing the shelves of a brick-and-mortar retail store. Shopping on the computer saves the gallons of gas that previously drove you to the store. Products travel directly from distribution center to consumer without a middle destination. These innovations vastly improve our quality of life. But sadly, not everyone is principled. Even though Amazon has expanded market competition, destroyed inefficient retail business models, and reduced state power, it still wants cronyist government assistance. Tomorrow, take action against corporate handouts, not the FCC. WASHINGTON, D.C. -- FreedomWorks is hosting its Digital Day of Action today in support of the First Step Act, which currently awaits action in the Senate. The First Step Act is a bipartisan, common sense bill that utilizes evidence based policies to lower crime rates, enhance public safety, save taxpayer dollars, and help fix the United States’ broken justice system.